The microstrip antenna was first proposed by G.A. Deschamps in 1953, but didn't become practical until the 1970s when it was developed further by researchers such as Robert E. Munson (now in our Microwave Hall of Fame!) and others using low-loss soft substrate materials that were just becoming available. Also referred to as microstrip antenna, or abbreviated MSA. For now we will only be discussing rectangular, single-polarization microstrip antennas, there are many other variations, enough to fill a book. A good volume on this subject is Broadband Microstrip Antennas, by Kumar and Ray. Go to our book section and we'll help you order it from Amazon. The size of a microstrip antenna is inversely proportional to its frequency. 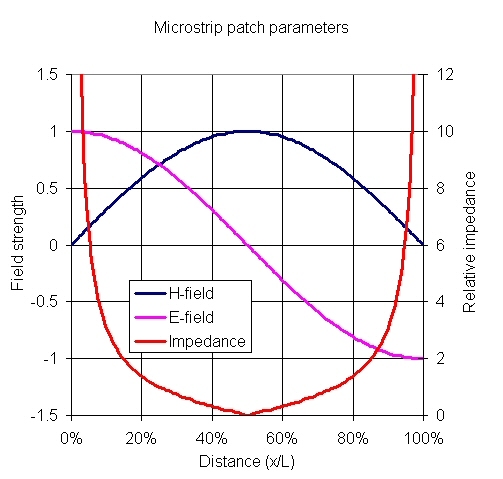 At frequencies lower than microwave, microstrip patches don't make sense because of the sizes required. At X-band a microstrip antenna is on the order of 1 centimeter long (easy to realize on soft-board technology). If you wanted to make a microstrip antenna to receive FM radio at 100 MHz it would be on the order of 1 meter long (which is a very large circuit for any type of substrate!) For AM radio at 1000 KHz, the microstrip patch would be the size of a football field, utterly impractical. One everyday application where microstrip patches are used is in satellite radio receivers (XM and Sirius). Here the antenna is often mounted in a vehicle, where the angle in the X-Y plane relative to the satellite is not fixed (like it is for the satellite television dish mounted to your house.) Thus circular polarization is employed for satellite radio, and the angle that the patch is with respect to the satellite doesn't matter. This is by far the most popular type of MSA. The figure below shows the geometry of the rectangular microstrip antenna, not including the ground plane and dielectric which would be underneath. The dimension L is universally taken to mean the long dimension, which causes resonance at its half-wavelength frequency. The radiating edges are at the ends of the L-dimension of the rectangle, which sets up the single polarization. Radiation that occurs at the ends of the W-dimension is far less and is referred to as the cross-polarization. The image below is a side view which attempts to show a snapshot of the E-field under the patch. Note that the fields under the L-edges are of opposite polarity (due to the half-wave nature of the patch) and when the field lines curve out and finally propagate out into the direction normal to the substrate they are now in the same direction (both facing left). In the far field perpendicular to the substrate, the radiation from the two sides adds up because the fields are in phase and voila you have a an antenna! As you look out in directions off of boresight, the intensity drops off as the fields of the two edges become farther and farther out of phase. At two angles the fields exactly cancel. (We'll explain that more later). Thus the microstrip patch radiation intensity depends on what direction you are facing it from (it has gain and directivity). For a microstrip antenna to work, you want to think the opposite thoughts that you might want to think if you were designing a microstrip MMIC. You want the thing to radiate! The path toward this is threefold. First, the structure needs to be a half-wavelength resonator. Second, use a low dielectric constant under the patch. Third, use a thicker dielectric than you normally would, but keep in mind the height must still be just a fraction of a wavelength. 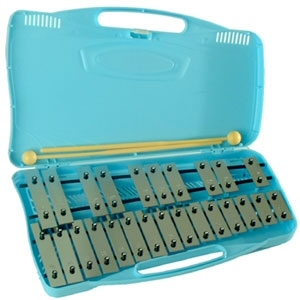 To use an audio analogy, a glockenspiel uses half-wavelength resonators suspended at nodes placed a quarterwave apart. Like the microstrip antenna, the width of the keys are significantly less than their length. The primary mode is a resonance along L, but by forcing W to be 1/4 L, if any mode is excited in the W direction it is harmonically related and it doesn't hurt your ears! 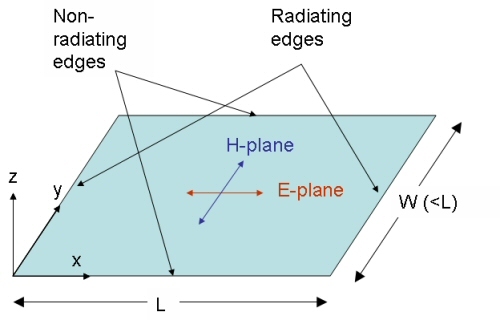 The image below is a depiction of the relative intensity (and direction) of the E and H-fields along the L-dimension, ignoring the radiation that occurs at the edges. The magnetic field is perpendicular to the E-field according to Maxwell's equations (it is in and out of your monitor). At the edge of the strip (X/L=0 and X/L=1) the H-field drops to zero, because there is no conductor to carry the RF current, it is maximum in the center. The E-field intensity is at maximum magnitude (and opposite polarity) at the edges (X/L=0 and X/L=1) and zero at the center. The ratio of E to H field is proportional to the impedance that you see when you feed the patch. If you adjust the location of the feed point between the center and the edge, you can get any impedance you'd like, including fifty ohms! Perhaps another intuitive way to look at the input impedance to a microstrip patch is to think about how far you are from an open circuit. If you feed it at the center, you are looking at a short circuit in both directions, because you are a quarter-wave from an open circuit. If you feed it at the edge you see an open circuit, because you are a half-wave from another open. 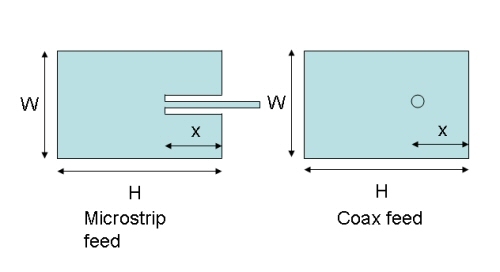 The image below shows two ways to feed the microstrip patch, on the left is a microstrip feed and on the right is a coax feed. What dielectric constant defines the half wavelength? The dielectric constant that controls the resonance of the antenna is the effective dielectric constant of the microstrip line. You can use our microstrip calculator to come up with the value! What is the best choice for the dimension W? In other words, use the average of the value for ER of the substrate and ER of air(=1) to obtain a half-wavelength. One way of improving bandwith is to add a second patch over a driven patch. More to come!